On February 13, 2018, Marilene Boza Stonoga, resident of São Jose dos Pinhais, Brazil, received from her friend and neighbor, Zita Grebogi, a prayer book entitled: “The 24 Hours of The Passion of Our Lord Jesus Christ,” by Servant of God, Luisa Piccarreta. Marilene took on the responsibility to pray the midnight to 1am during Lent in a practice which has become known as “The Clock of 24 Hours of the Passion.” Yet, Marilene began to pray this midnight to 1am hour the same day she received the book, invoking the intercession of the Servant of God, Luisa Piccarreta for her particular intentions. On February 24, 2018, approximately at noon time, Marilene’s son-in-law, Laudir Floriano Waloski, fell of a ladder while he was cleaning the roof of his house. His wife rushed outside to see what happened and found her husband on the ground with blood coming from his ears and his face distorted. He was rescued by the emergency SAMU group and taken to Cajuru Hospital in Curitiba, Brazil. On the way to the hospital, Laudir had two heart attacks, and when he got to the hospital, the doctors informed the family he had suffered a severe cranial trauma and his state was very serious. Marilene, from that day on, started praying asking Luisa Piccarreta’s intercession for the recovery of her son-in-law. While Laudir was still in the ICU, Marilene gave her daughter, Maria Eloisa, a holy oil to rub on his head and pray to God asking his recovery, and so Maria Eloisa did, praying the rosary every day. On March 4, 2018, Laudir opened his eyes for the first time, showing the first steps of his recovery. On March 25, 2018, Sunday of Holy Week, Laudir was discharged from Marcelino Champagnat Hospital and transferred to a Rehabilitation Hospital in Curitiba, Brazil. During almost all Lent, Laudir was in the hospital, with memory loss. His daughter visited him on Good Friday, March 30, 2018, which became a significant part of this miracle. As it happened, this incident became Laudir’s first memory: on Easter Sunday, April 1, 2018, he suddenly remembered his daughter’s visit and that they were both looking out the hospital window. On Monday, April 2, 2018, a day after Easter, Laudir was discharged from the Rehabilitation Hospital and went back home, but he didn’t remember some of his family members, and didn’t even know his own name — he had no thoughts; his head was empty. He forgot almost everything, but he did not forget the prayers he knew, and every night after being discharged from the hospital, he prayed the rosary. After three days at home, that evening after praying the rosary, he began to remember the names of 20 people friends and relatives whom have passed away. He described these souls as conversing with him. Nowadays Laudir is walking well and talking normally. His memory is improving day by day. He is now a new person, much more devout and spiritual. A chain of prayers was held since the day of Laudir’s accident, and now he prays the rosary every night for the souls, for the health of all people who helped him in this journey of recovery, asking for Luisa Piccarreta’s intercession, who definitely listened to our prayers and interceded for us, making this miracle possible. Marilene attributes this miracle of her son-in-law to the intercession of Servant of God, Luisa Piccarreta, particularly through her writings of the 24 Hours of the Passion of Christ. 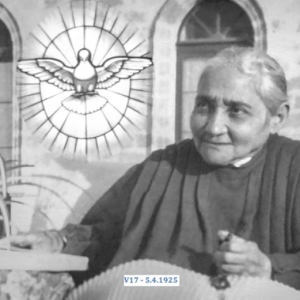 CURRENT STATUS: Bishop Dom Celso Marchiori of the Diocese of São Jose dos Pinhais, Paraná, Brazil, has commissioned a formal investigation of this miracle with the intention of sending it to the Postulator of the Cause of Beatification of Servant of God, Luisa Piccarreta.